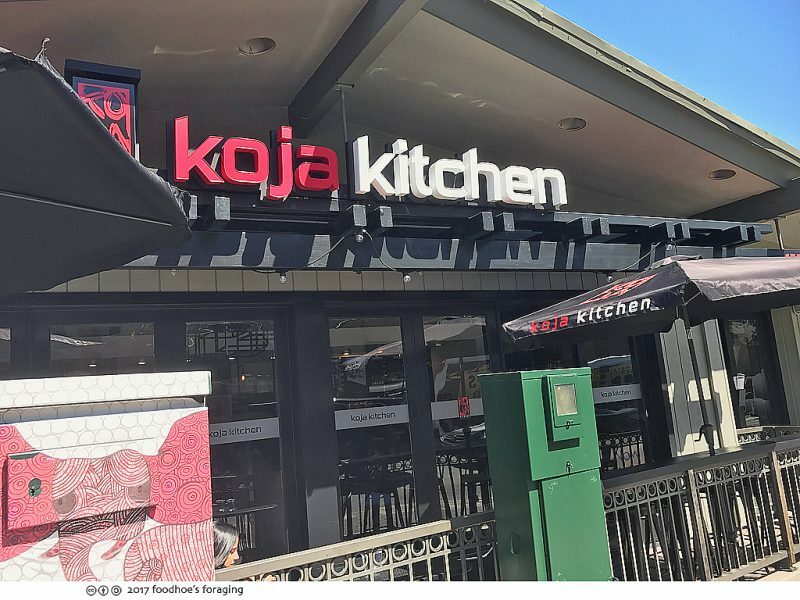 I was so happy to hear that Koja Kitchen opened a restaurant in Walnut Creek. 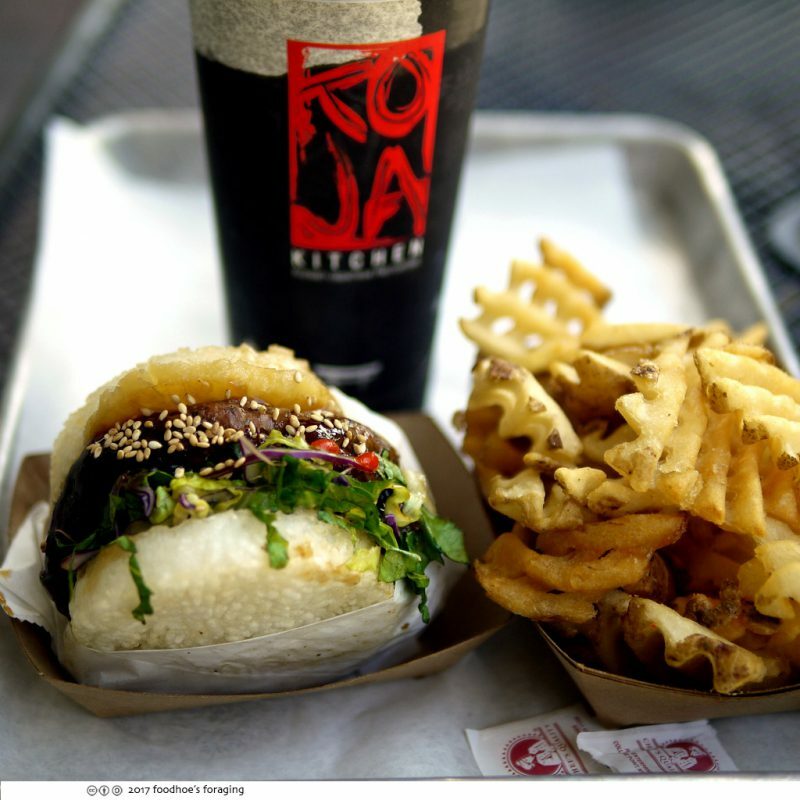 I’ve loved their delicious koja burgers (the ones with the fried garlic rice buns) since the first time I tried one from their food truck at the Eat Real festival 5 years ago… Koja is a unique sandwich that combines the best of Korean & Japanese flavors that are cradled within their signature crispy fried garlic rice buns. The restaurant is located at a busy downtown corner but has its own parking lot (parking meters), and I’ve been pretty lucky scoring a spot there, or in the lot by Z Gallery at Mt Diablo and Locust. The decor is sleek and modern with edgy lighting and additional seating outside. 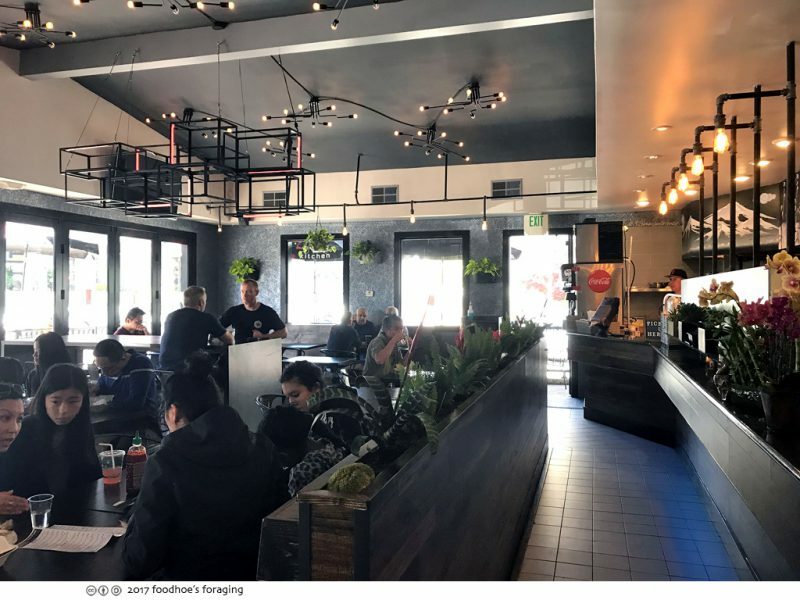 The format is fast-casual where you go up to the counter to order and pay for your food, they give you a pager that flashes when your food is ready to pickup. The pager goes off, you can’t not notice the blinking lights and it vibrates energetically to get your attention. This is an exciting moment… Your food is waiting for you on a tray at the pickup window. This is an order of plain waffle fries that are not on the menu in the picture below. There are a couple of sides that you have to try, they are decadently delicious dishes that are meant to be shared… The Kamikaze fries ($6.25) are a mound of crosscut waffle fries, topped with minced korean bbq beef, kimchi, japanese mayo, sweet and spicy red chili sauce, brightened by slices of green onions. 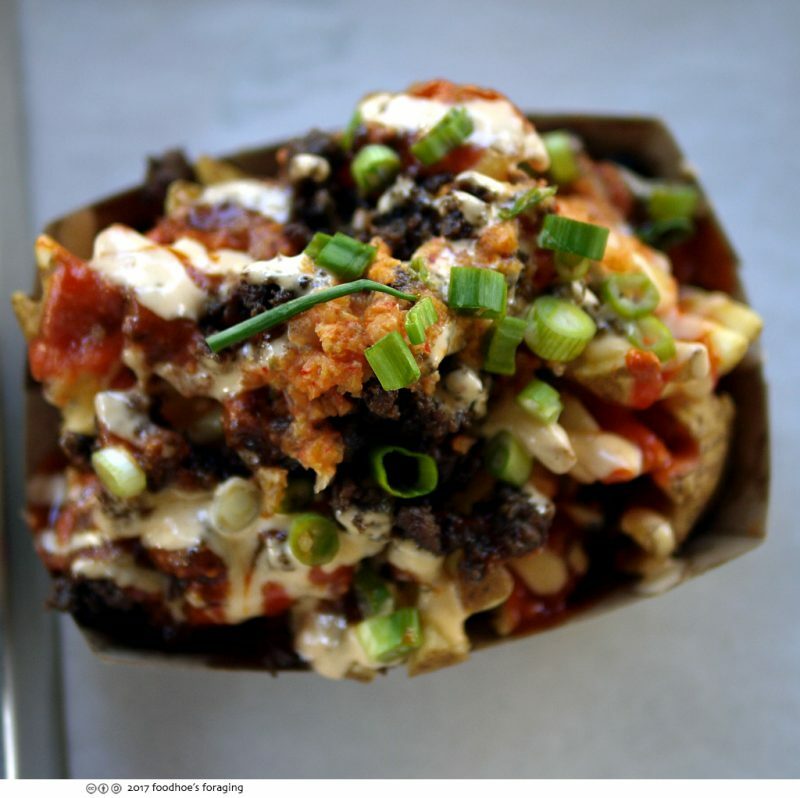 The Umami fries (not pictured) are topped with miso-coconut braised pork, red chili sauce, garlic aioli, fried onions. This is the Original ($9.75) made with bbq short rib (kalbi), sesame vinaigrette lettuce, katsu aioli and sesame seeds, and those fabulous fried rice buns. So what makes the buns so special? 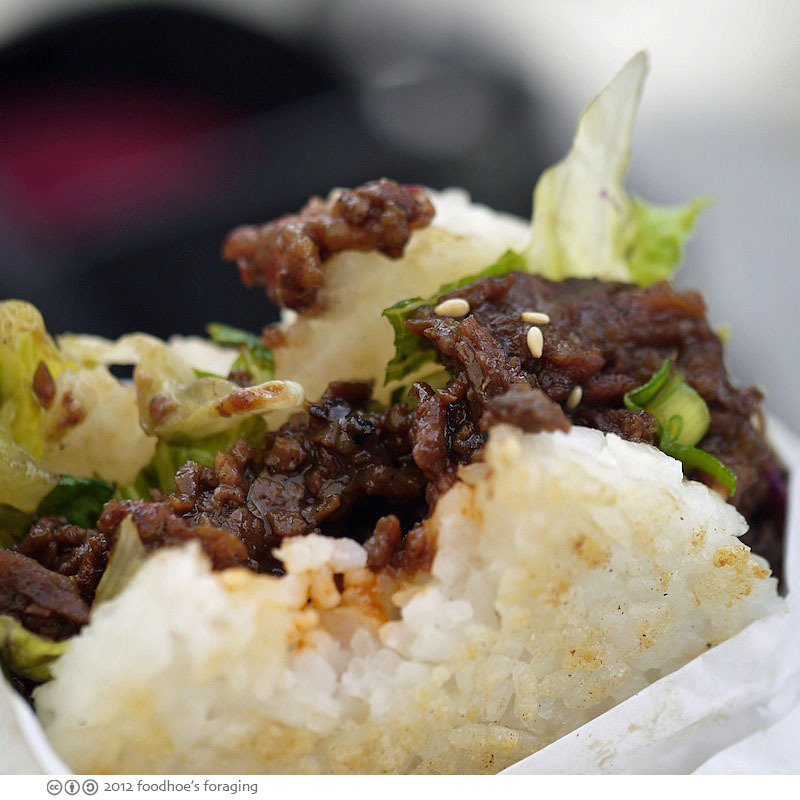 They are made from garlic fried rice that is pressed into a half inch thick patty that is deep fried until it develops a delicate golden crust with crunchy edges. The kalbi is intensely flavorful from soy sauce, garlic, sesame oil and sugar that is balanced with the fresh crisp lettuce tossed in vinaigrette. My server said her favorite was the pork, so I had to try it. 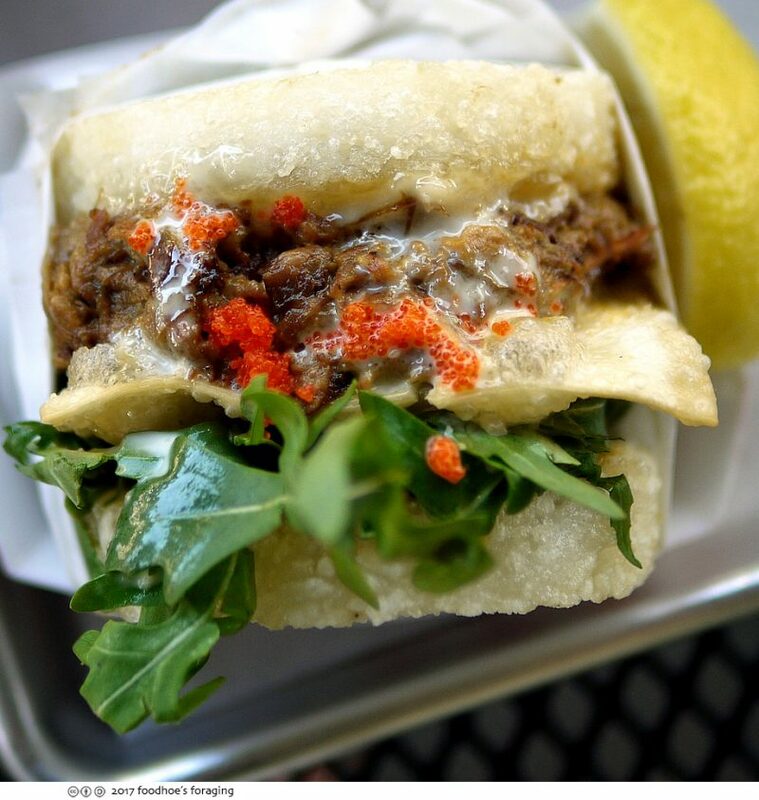 The Braised Pork Koja ($8.50) was packed with tender miso-coconut braised pork, lightly dressed arugula, a crunchy wonton chip, drizzled with garlic aioli, a bit of crunchy masago roe, served with a lemon wedge to balance all the richness. And this is what it looked like after I took off the paper wrapping and flipped it over to the other side, the delicious juices soaked into the rice bun… Be warned that each rice patty bun has to be equivalent to a bowl of rice, so the whole sandwich is really filling! 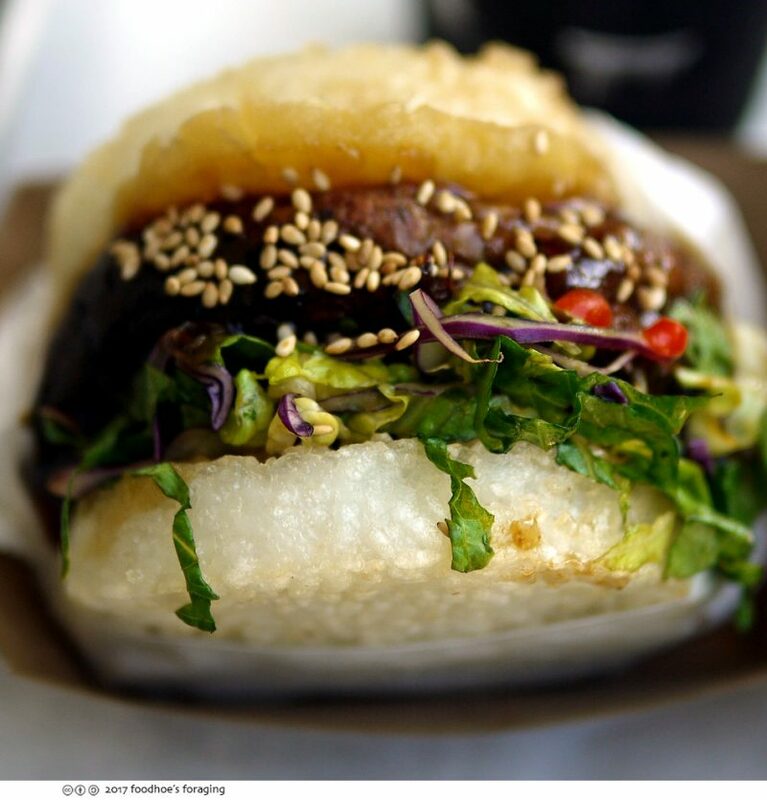 I liked the vegetarian option called the Teriyaki Zen Koja ($6.50), a tofu and portobello mushroom patty that has a nice chewy texture, drizzled with teriyaki sauce, a slice of sweet pineapple, sesame vinaigrette lettuce, topped with toasted sesame seeds. The Chicken Taco ($3.25), korean bbq chicken, sesame vinaigrette lettuce, wasabi mayo, cilantro, fried onions was less of a gut buster, but very satisfying. I was disappointed with the Ahi Tuna Salad ($11.95), which I ordered with a mix of salmon and ahi (you can have Ahi only, Salmon only or a mix). 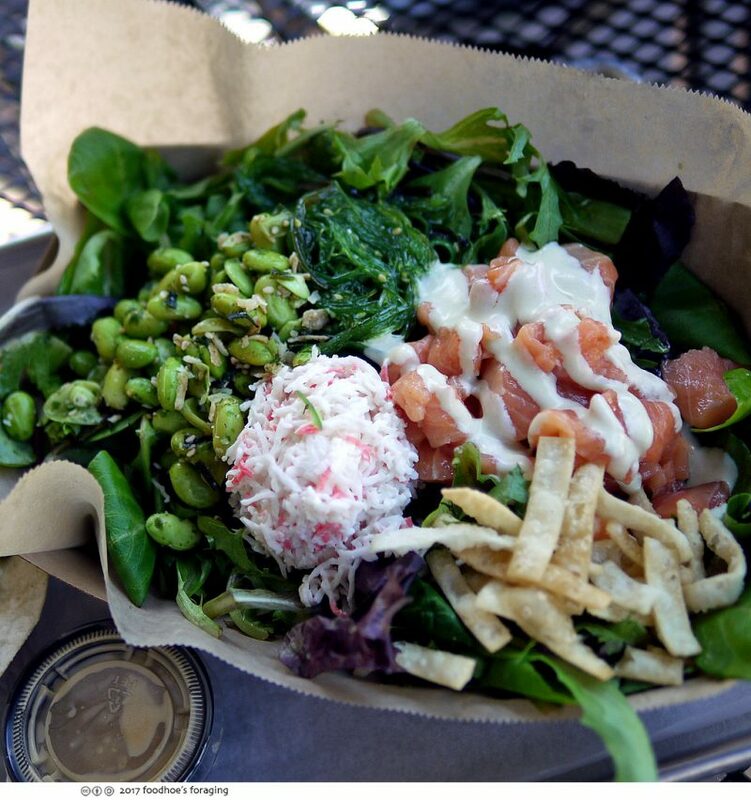 There is some seaweed salad, seasoned edamame, wonton crisps, wasabi mayo, imitation crab salad, masago (tiny crunchy fish roe), soy ginger vinaigrette, and spring mix. It was just ho hum, bland and it didn’t blend well together. 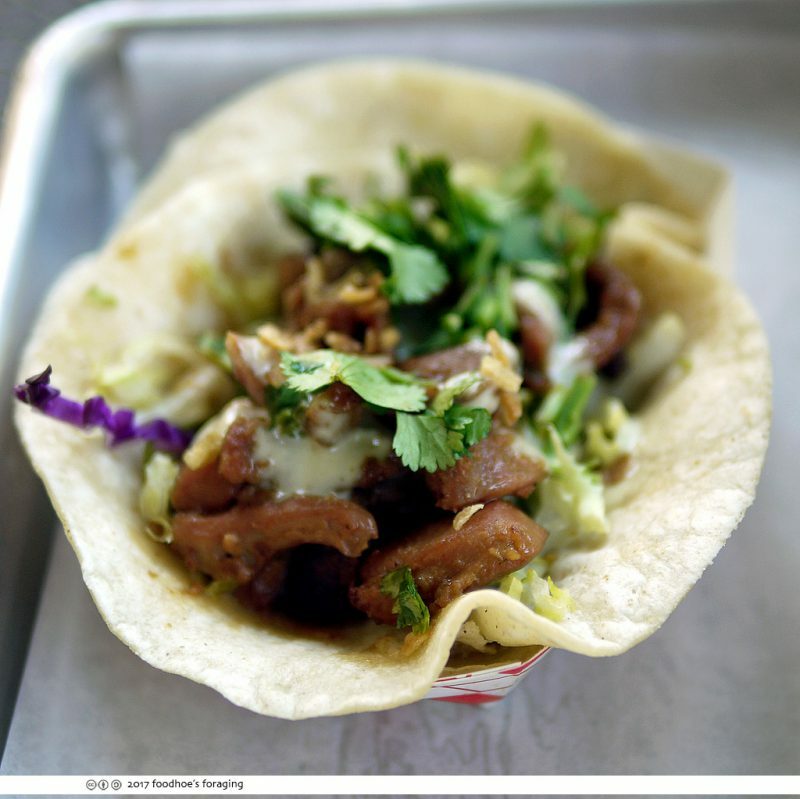 But then, why bother with salad when you can have those crazy delicious Koja, tacos, bowls or fries? 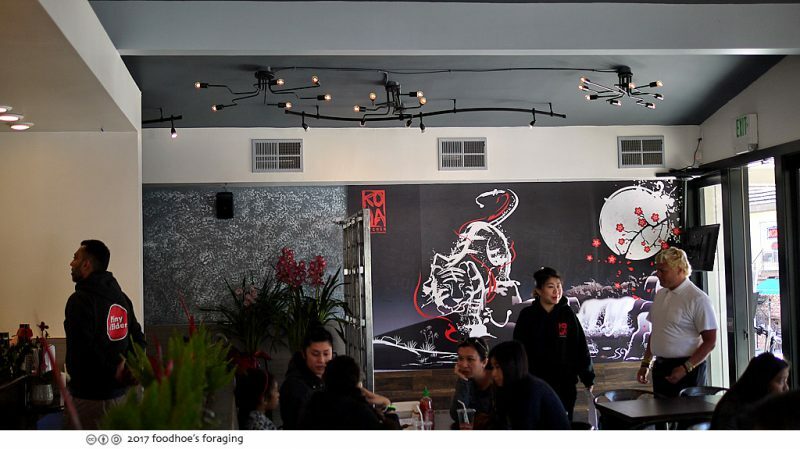 Whew, just looking at these photos is making me crave that addictive crispy Koja, and then I see wings on the menu, which I have yet to try. Yes, I see another visit in the very near future! 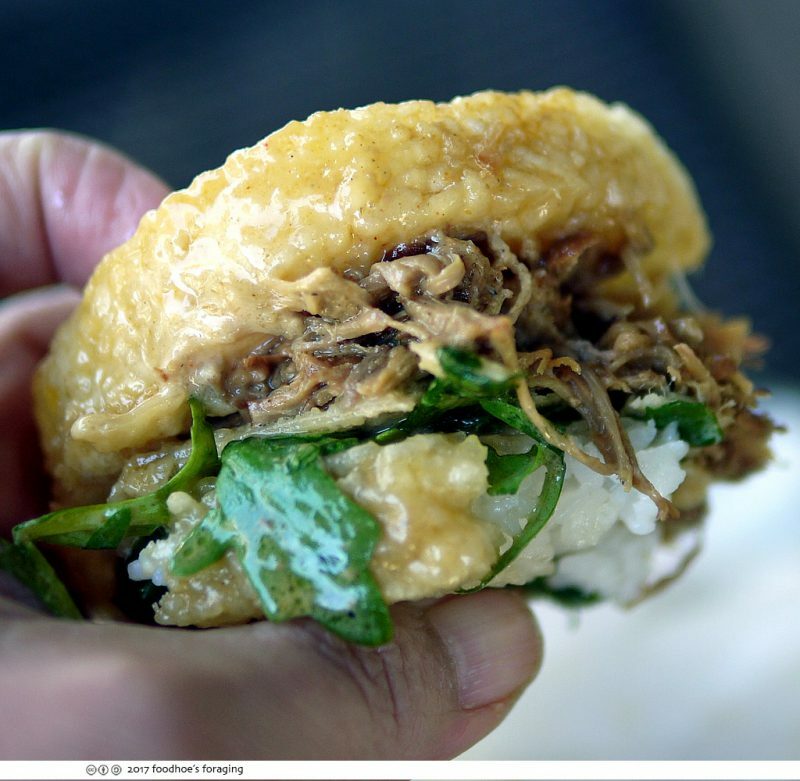 As someone who loves the crispy bits of rice, I am longing to try these garlic rice buns. And those waffle fries are like a whole ‘nother take on poutine that’s just outrageously fun.